It’s Easter, so what does that mean to you? It’s Easter, so what does that mean to you? I know most of us look forward to having a few days off and maybe even having a short break away somewhere. It’s a popular Aussie thing for families to go camping at Easter. It can be quite different for adults though, that excitement can sometimes morph into stress. Are you worried that temptation will get the better of you and all your good intentions will fly out the window? Hey, I get it. We all love chocolate! 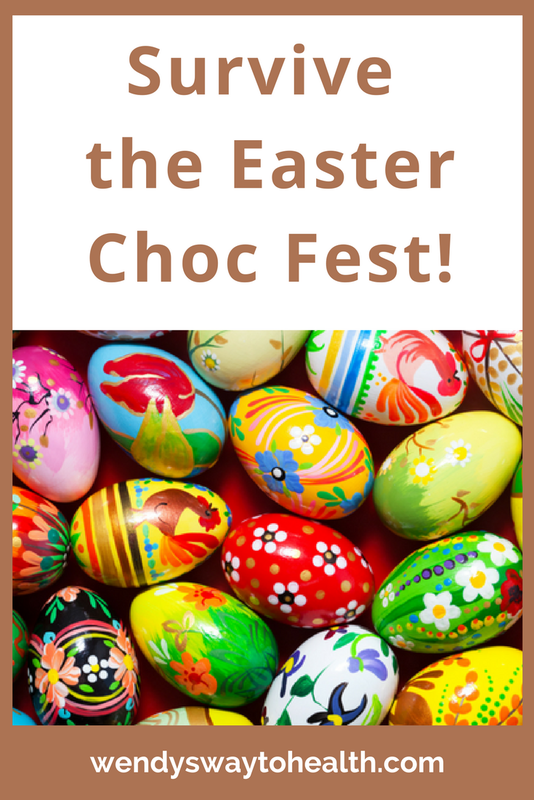 So don’t worry, I’ve got some common sense tips & tricks to share so you can enjoy your Easter chocolate without overindulging or feeling guilty. Planning is the key to success and it’s always better than winging your way through on a hope and a prayer. It doesn’t need to be complicated; just take a few minutes to think about how you would ideally like things to go. Are you going to eat any chocolate or Hot Cross Buns? If so, how many/how much and when? Will you be buying and receiving Easter Eggs? Are there any social situations you’ll need to deal with? If you really love chocolate, don’t try to not have any, unless you’re truly an ‘all or nothing’ person. Telling yourself that you can’t have any usually ends in a binge session at some point down the track. Moderation works well for most people, so allow yourself a certain amount and stick to that. Decide on how much you’re going to eat and then take your time to really enjoy it. Be in the moment and savour the smell and taste without any distractions. Try to give the food your full attention and chew slowly. Appreciation will help you respect your food and yourself. A little bit of raw, dark chocolate really is good for you, so why not make yourself some? You can use different moulds to make different shapes and add your favourite nuts or dried fruit. And with just 3 ingredients, it’s really easy! Grab my recipe here: Raw Chocolate. As for Hot Cross Buns, there are loads of recipes around for healthier versions. When you make your own, you know exactly what’s in them! Stick to your regular training schedule if you can, or re schedule where possible — having a break often makes it that much harder to get back into afterwards. Take the opportunity to do something different like a walk, hike or bike ride with the family. You can say no in social situations — don’t feel obliged to eat something if you really don’t want to. If your host simply won’t take no for an answer, then ask for a doggy bag to take home, or have a small portion. When things don’t go according to plan, remember that nobody’s perfect and slip-ups are normal. Forgive yourself and get straight back on track. And my final tip is: a little bit won’t hurt, it’s good for the soul! Originally published at wendyswaytohealth.com on April 12, 2017.